The oceans remain one of the least explored frontiers of our region of the solar system; more is known about the surface of the moon and of Mars than is known about the watery landscape that covers 71% of our planet. 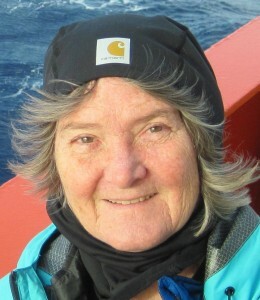 My research uses tools from genetics, cell biology, oceanography, and remote sensing to explore connections between microorganisms in the sea and the physical processes that determine their abundance, distribution and productivity. Unlike many ecologists, who tend to view the properties of the organisms they study as relatively static, my research is guided by an evolutionary perspective within which we recognize that both evolutionary history and evolutionary potential lead to dynamic ecological patterns. Dooittle, D.F, W.K.W. Li, and A.M. Wood. 2008. Wintertime abundance of picoplankton in the Antarctic sector of the Southern Ocean. Nova Hedwigia. 133:147-60. Everroad, C., C. Six, F. Partensky, J.-T. Thomas, J. Holzendorff, and A. M. Wood. 2006. Biochemical Bases of Type IV Chromatic Adaptation in Marine Synechococcus spp. J.; Bacteriology, 188:3345-56. Miller, S. R., S. Augustine, T. L. Olson, R. E. Blankenship, J. Selker, A. M. Wood, 2005, Discovery of a free-living chlorophyll d-producing cyanobacterium with a hybrid proteobacterial/cyanobacterial small-subunit rRNA gene. PNAS 102 (3): 850-855. Arnone, R. A., A. M. Wood, R. W. Gould, Jr., 2004, The Evolution of Optical Water Mass Classification. Oceanography 17 (2): 14-15. BI150 – Ocean Planet – an introduction to ocean ecology and marine policy that meets General Education Distribution Requirements in the Natural Sciences and uses an inquiry-based, active learning educational model to promote both science literacy and a lifelong ability to appreciate and understand nature. BI357 – Marine Biology – a course in general marine biology for majors and other students with a solid foundation in biology. This course takes an evolutionary and systematic approach to the diversity of life in the ocean and a broad ecosystem based approach to understanding marine ecosystems. It meets requirements for a laboratory and field-based course for Biology majors. BI410/510 – Tropical Marine Biology. Literature and discovery based course that emphasizes the ecology and contemporary issues facing tropical marine ecosystems globally. We consider both the natural history and human ecology, and the international scope of these issues. BI607 – Ecology and Evolution Seminar. Topics presented by experts doing research at the forefront of ecology and evolutionary biology. Generally speakers are from off-campus and hosted by members of the Institute of Ecology and Evolutionary Biology.